In 1990, The Church of the Covenant formed a partnership with its neighbor, John Hay High School, in the Cleveland Metropolitan School District. Volunteers began tutoring students at the school and at the church under the direction of the chair of John Hay's English Department. Since that time, The Saturday Tutoring Program has developed and grown. Over the years, hundreds of students have received free tutoring from our volunteers. Currently, The Saturday Tutoring Program provides free tutoring services for students in grades 1-12 from twenty-one school districts throughout Greater Cleveland. The program occurs in an environment of mutual learning and respect to help students achieve their academic goals. Our volunteer tutors come from universities, church congregations, service organizations, and the community at-large. Tutors and students cover a variety of subjects including math, reading, and science. 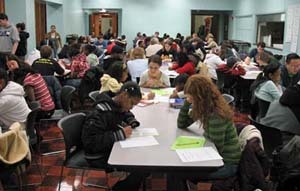 Tutors also help students prepare for Ohio tests and college entrance exams. The Saturday Tutoring Program thanks the supporters that generously provide volunteers, grants, and in-kind gifts to make the tutoring program possible! For many years, field trips have been an integral part of The Saturday Tutoring Program. These trips are much more than fun outings. For many of the students, the trips are their first visit to any museum or cultural site. The trips provide opportunities for the students and their tutors to interact in other settings. Field trips have helped the students expand their horizons beyond their own schools and neighborhoods. Chaperoning field trips to Cleveland landmarks has also strengthened the tutors' ties to the city. When the Ohio Ninth-Grade Proficiency Tests were replaced with the Ohio Graduation Tests (OGT), the Heights-Hillcrest-Lyndhurst Branch of the American Association of University Women (AAUW) published a study guide entitled The New Little Book. Written by Cleveland-area teachers and members of the AAUW branch, the guide covers all sections of the social studies portion of the OGT. The forerunner of the guide was The Little Book, which was an important, far-reaching result of our tutors' work at John Hay High School in the 1990's. 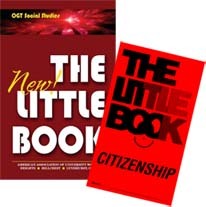 The Little Book was a pocket-sized, paperback handbook designed to help students handle the difficult hurdle of the citizenship portion of the proficiency test. The Little Book was drafted by a committee of Covenant tutors, former teachers, and a retired attorney. The chairman of John Hay's Social Studies Department assisted with preparation of the book, and he later wrote and field-tested the Companion to The Little Book for Teachers and Tutors, which had dozens of practice questions for each topic.